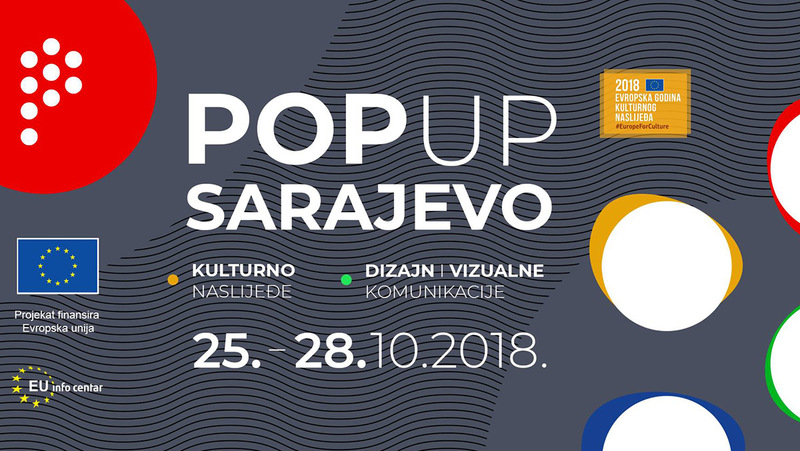 The EU Info Centre, in co-operation with the Academy of Fine Arts Sarajevo, organised this year’s edition of the Pop-up! Sarajevo Festival, a student festival of visual communication, graphic design and new creative solutions. This three-day festival, which drew the curtain on Sunday, promotes excellence in design and gathers students and experts from the region as well as from the European Union. The 2018 edition of the Festival was dedicated to celebrating the European Year of Cultural Heritage as the topic of workshops and exhibitions within the Festival. Khaldoun Sinno, Deputy Head of the EU Delegation to BiH, greeted the students during the Festival’s opening ceremony, underlining the fact that festivals like the Pop-up! Sarajevo help experts understand the creative potential of students, and noting that culture lies at the heart of the work the EU is focused on. “The European Union considers culture and art to be one of the most important features of our common European identity. We take pride in our diversity, which represents our common ground. Cultural diversity is an integral part of the values of the European Union and it is our strength. Culture and art contribute to identity-building and self-esteem, and enriches the society. It is a powerful tool that promotes dialogue and reinforces mutual understanding”, Sinno said. Renowned visual artists, graphic designers and illustrators who held lectures during the Festival marked the festival’s opening ceremony with an exhibition of works of art. During the Pecha-Kucha presentations, students had the opportunity to hear about notable local and regional artists who have received prestigious awards and recognitions, including the campaign I am the Museum, which received the Europa Nostra award for the protection of cultural heritage. “This year’s Pop-up! is important because, beside the guest speakers, we have the opportunity to host design and visual communication students from Banja Luka, Cetinje, Rijeka, Split, Široki brijeg and Trebinje. We are happy that the Festival’s energy is spreading and that we are becoming a hub for connecting students from BiH and the region”, Bojan Hadžihalilović, a professor at the Academy, noted. Pop-up! Festival was established in 2012 by a group of students from the Academy of Fine Arts Sarajevo in order to celebrate excellence in visual communication, graphic design and new creative solutions, as well as to enable an annual gathering of students and professors from throughout the country and the wider region, in order to exchange ideas and learn from some of the most well-known experts. As the EU Delegation to BiH said in the press release, the objective of the festival is to facilitate long-term synergies between policies and programmes in culture, employment and youth development, to promote creativity and innovation, as well as to promote specialised training in culture, new media and intercultural skills for younger employees.